You are here: Home / Ethnic Groups / The People of Sumatra / Who are the North Sumatra Malay? North Sumatra is the homeland of both the Batak ethnic group who live in the mountains and the Melayu (Malay) people who live on the eastern coast. Other people groups also live there, including the Jawa, Nias, and Mandailing. The Malay people in North Sumatra are not actually an ethnic group, but rather a culture influenced by Islam. The Malays in this area use clan names, called marga, to specify if they come from the Karo or Simalungun clan, which are Muslim. Many Malay clans use Karo clan names. Even the ancient sultans of Langkat, Asahan, and Labuhan Batu in the North Sumatra Malay area had Karo clan names. Most North Sumatra Malay live on the coast as fishermen. The waters in the area are known for their plentiful fish and oysters. Some also work as farmers producing rice, rubber and coconut oil. Others make a living by weaving cloth. Cloth from the Asahan clan, called songket, is hand-woven with gold or silver threads. Songket is usually dark blue or green, and is only used on special occasions. Unlike other Malay people, the North Sumatra Malay trace their ancestry through the mother’s side (matrilineal). This is because of the strong influence from the Minangkabau people group. However, family names are still taken from the father’s side (patrilineal). Bandar Ahmat is an example of a patrilineal clan name. After marriage, the new couple lives near the wife’s family. But after they have children, they normally move to a new house near the husband’s family or to another new location. In the family, the husband and wife share equal status. This is seen as consistent with the teachings of Islam. Because of this, both boys and girls have inheritance rights from their parents. 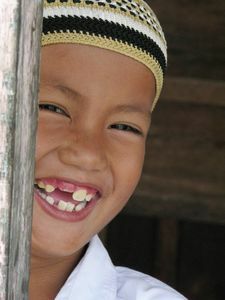 The North Sumatra Malay often avoid speaking frankly for fear they will offend someone. They use signs, parables, and traditional poetry instead. Another element of traditional North Sumatra Malay culture is traditional theater, makyong, and traditional dance, main lukah menari. In the dance, they believe they get supernatural power by using incantations and occult puppets called lukah. Their art has been heavily influenced by Islamic elements and is similar to Malay art from Malaysia. There are two main social classes among the North Sumatra Malays: the nobility and the common people. Within the nobility, there are upper and lower classes. The upper class consists of the king’s family while the lower class consists of the descendants of important officials from the area. Common people also show special respect to village leaders, religious leaders, and wise men. Most North Sumatra Malay are Sufi Muslims. In fact, it is often said that all Malays are Muslim. However, they still hold to their old animistic beliefs. They believe that the teachings of Islam come from their own traditional values which give priority to orderly, harmonistic life together where each person respects the other. They also believe that spirits are everywhere and influence people’s lives. Because of this, their traditional rituals and ceremonies are centered on acquiring supernatural protection by overpowering or controlling good and evil spirits. The North Sumatra Malay still need help in how to better use their land and sea. They need help to raise their standard of living through more efficient farming methods and fishing technology. Up to the present, they have had difficulty creating new jobs or obtaining new skills.